Kolkata: Nishu Kanta Pal has just finished shaping a dozen clay idols of goddess Durga at his dingy workshop in Kumartuli, Kolkata’s 300-year-old potters’ settlement, and is taking a breather before starting work on idols of Lakshmi, Kali and Jagaddhatri—the other female deities to be worshipped in the festive season before winter sets in. His order book this season runs into hundreds of thousands of rupees. Yet, Pal is upset. “See the conditions we live in," says Pal, a fourth-generation idol maker of Kumartuli. Some 500 artisans live and work in Kumartuli, a putrid labyrinth of narrow, muddy lanes, rotting garbage and reeking urinals. It is believed potters from Nadia district settled here in the late 17th century on a 75-acre plot after being evicted by the East India Company from Gobindapur—one of the three villages that were eventually combined to form Kolkata. “We have to cover the idols with plastic sheets to save them from the rainwater," says Pal pointing to the leaking roof of his workshop. The state of every other workshop in Kumartuli is almost the same. Such is the paucity of civic infrastructure in the settlement that the government had decided to raze it down altogether and rebuild under the Jawaharlal Nehru National Urban Renewal Mission, or JNNURM. But the project announced almost three years ago is hanging fire because the state government couldn’t arrange land where the artisans’ workshops could be moved. “We were taken to Cossipore, Dhapa and Bagbazar but for some reason or the other, they all fell through," says Mintu Pal, president of the Kumartuli Mrith Shilpa Samity—the potters’ association. “Now, they want us to resettle on the banks of the Hooghly between Bagbazar and Sovabazar Ghat (in north Kolkata), but the local people have opposed it." 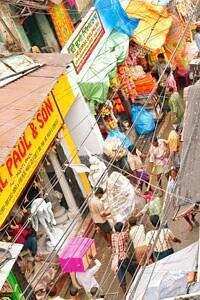 Urban development minister Asok Bhattacharya, however, blames the artisans. “They were not flexible and found faults with all the sites we showed them," said the minister. “However, we are confident that after Jagaddhatri Puja (which is the last puja this autumn), we will be able to work out a solution… because otherwise the project will have to be scrapped," said Bhattacharya. Local parliamentarian Sudhanshu Sil, too, is hopeful of finding a solution soon. “I am confident we will be able to make all parties understand and the project will take off in November after the festive season ends," said Sil, who is a leader of the Communist Party of India (Marxist). The latest site suggested by Kolkata Metropolitan Development Authority, or KMDA—the civic body entrusted to execute the Kumartuli rejuvenation project—is a narrow strip of land sandwiched between the Hooghly river and Strand Bank Road. “The place is already congested and (is) used to park trucks. If we go there, the situation will worsen," says Mintu Pal. Pal is a common surname among the clay artisans. According to the original plan, KMDA was to have got broad roads, improved water supply and drainage, modern workshops and even a gallery for the artisans to exhibit their works. The makeover, which was to have taken two years to complete, was estimated to cost Rs26.85 crore. Of this, Delhi was to contribute 35%, the state government 45%, and the artisans 20%, or around Rs5.4 crore. The artisans have been asked to pay Rs35,000 each, or around Rs1.75 crore in all. KMDA would arrange a loan for the artisans to pay the rest. “When the project was first mooted we were told that all of us would have to pay Rs20,000 each," says Babu Pal, general secretary of the artisans’ association. “This is arbitrary, and should be according to the individual’s ability to pay." Though they are upset about having to pay a flat fee, and not on the basis of the size of each workshop, the artisans don’t want to squabble with the government because they want the project to start without further delay.